The BMW 3 Series competes with the Mercedes-Benz C-Class and Audi A4 for the affections of middle-management everywhere. The archetypal business saloon, the BMW 3 Series competes with the Mercedes-Benz C-Class and Audi A4 for the affections of middle-management everywhere. BMW has always traded on being the most sporting of that trio, the 3 Series regularly winning accolades as the best driving car among its peers. This 3 Series, which ran from 1998 to 2005, has all those qualities, at affordable prices used. In BMW-speak this 1998-2005 generation 3 Series is known as the E46. It was available in saloon, coupé, convertible, estate (Touring) and M3 guise. During its eight-year run it offered everything from a 105hp four-cylinder engine badged 316i, through to the desirable six-cylinder petrol units, which in 330i guise developed over 230hp. Also offered were three diesel units: a four-cylinder turbodiesel badged either 318d or 320d depending on its output, through to the 330d, which offers seriously punchy performance - sub eight-second 0-100km/h - combined with impressive economy. Throughout its lifecycle all the engines offered delivered increased performance allied with improved economy, making the later cars the easiest on your bank balance for running costs - if not for initial outlay. Trim levels follow BMW’s traditional SE and Sport offerings. SE comes with pretty much everything you’d expect - air conditioning, alloy wheels, electric mirrors, alarm, remote locking and a CD player. Sport adds larger alloy wheels, mild styling revisions inside and out such as a three-spoke steering wheel and firmer suspension. Mid-life changes in 2002 brought in revised head- and taillights, more standard equipment and greater economy across the line-up. The E46 saw the demise of the badge on the boot lid relating directly to the engine’s actual capacity. 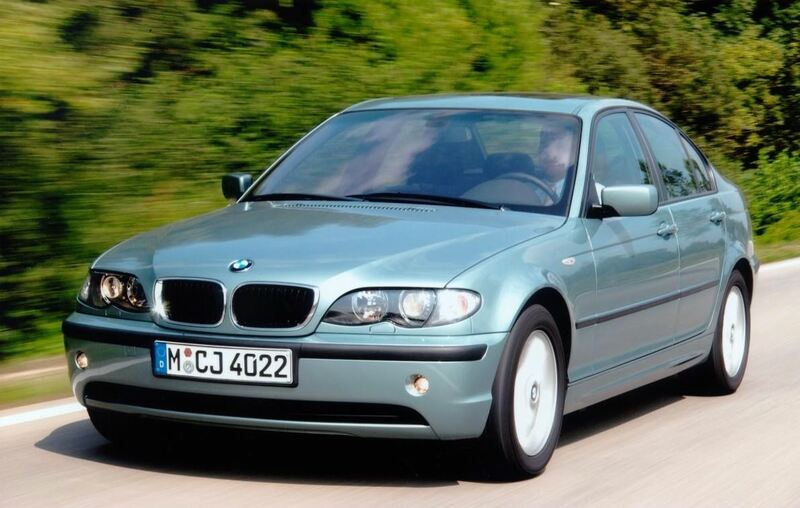 For instance, the 318d is actually a 2.o-litre unit in a lesser state of tune than the 320d. Check the logbook for actual engine capacity in any doubt. All come with manual transmissions, though optionally an automatic was offered. As tempting, and relatively inexpensive, it is to suggest the firepower of one of the bigger six-cylinder engines, the reality is smaller engines make sense here - and offer the greatest choice on the used market. Diesels tend to have covered higher mileages than their petrol equivalent, though there are reports of turbo problems causing engine failures. Play it safe then with a post-2001 318i powered by the 2.0-litre petrol engine. BMW’s sporting executive is a compelling used buy, and if you’re wise with your choice then running costs shouldn’t be too punishing. Resist the temptation of those six-cylinder engines and your wallet will thank you for it. Space isn’t as generous as in mainstream alternatives, but neither do they offer the feel-good factor and driving appeal of the BMW.